Yap Robo Day was the culmination of a school year long project in which student led teams designed and built robots. The League provides students at remote island schools practical experience in Science, Technology, Engineering, and Math (STEM). 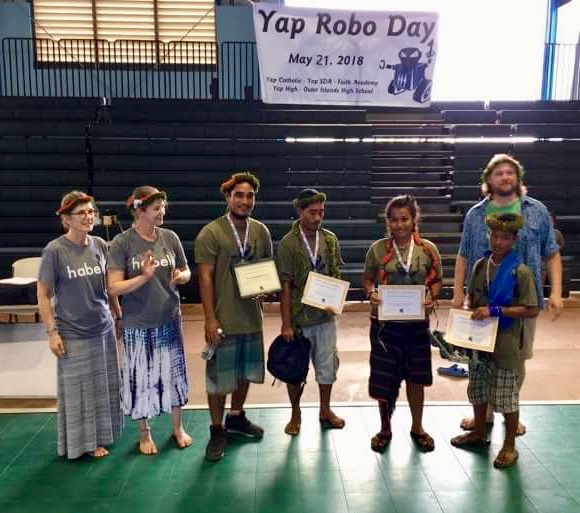 "Through the Yap Robo League, you the students have turned tiny scraps of metal and plastic into complicated robots that are able to complete complex tasks," said U.S. Assistant Secretary of the Interior for Insular and International Affairs Doug Domenech in a written statement read to attendees. "You can apply the same principles as you continue through life and pursue your own ambitious goals for education and growth in the future." The event was held at the Yap State Sports Complex and featured teams from Yap High School, Outer Islands High School, Yap Catholic High School, Yap SDA School, and Faith Christian Academy. Students, families, and the public gathered to watch timed matches in which robots raced to pick up colored donuts and place them on goal posts and in corner goals, or scramble to block other team’s robots attempting to do the same. Both the Yap State Public Service Corporation (YSPSC) and the Pacific Missionary Airline (PMA) fielded corporate partner teams, comprised of staffers who served as teachers and mentors to the students over the course of the school year. Yap’s State Department of Education supported and prioritized the work throughout. The Yap Robo League was first established in 2011 by Habele, a US-based nonprofit which provided donated robotics kits to two high schools. In 2017 an investment from the Office of Insular Affairs allowed for expansion to a true statewide, student-driven, league. After a heated series of multi-team qualification games and elimination battles, Yap Catholic High School’s team emerged as the winner, with Outer Islands High School earning a close second place. A key theme woven throughout the event was the sustainability of the League as a mechanism both for fostering student learning and as a vehicle for unprecedented cooperation among schools, which has extended to sports and other efforts beyond robots. "I said it multiple times throughout the planning process, and it certainly remains true: getting the first year under our belts is the biggest challenge –now it is just a matter of replicating and improving," observed Michael Wiencek, Principal of Yap Catholic School. Part of the League’s success and key to its sustainability are the partnerships developed between students in Yap and schools in the US. Robotics teams at Chaminade College Preparatory School in Los Angeles, California and South River High School in Edgewater, Maryland in particular provided generous material donations and peer-to-peer technical assistance. Citing the decades long strategic partnership between the United States and Federated States of Micronesia, US Ambassador to the FSM Robert Riley observed "Robo Day has a special significance in this regard, as private Americans have traveled to Yap to work closely and one-on-one with the next generation on innovative and cutting-edge technology to help set the agenda for Yap’s future. Technology is critical to economic development and private sector development, which in turn is critical to the future of the FSM. 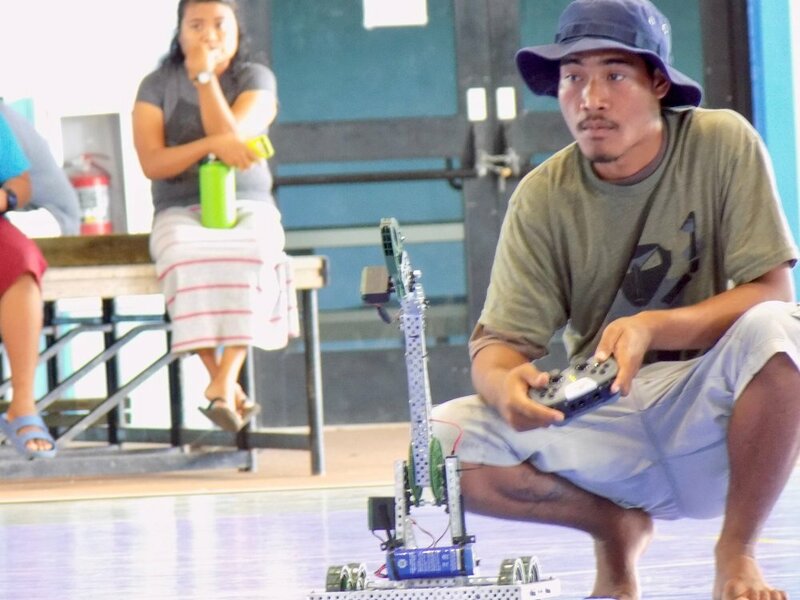 Habele has been in the forefront of this effort, establishing capacity and providing peer-to-peer support as Yapese navigate their own path as individuals and communities."